Induction heating is a fast, precise, repeatable and safe non-contact method for heating metals or other electrically-conductive materials. The material may be a metal such as brass, aluminum, copper or steel or it can be a semiconductor such as silicon carbide, carbon or graphite. To heat non-conductive materials such as plastics or glass, induction is used to heat an electrically-conductive susceptor, typically graphite, which then transfers the heat to the non-conducting material. Visit our Application Video Library to see various induction heating applications in action—perhaps an application just like yours! The induction heating power supply converts AC line power to a higher frequency alternating current, delivers it to the induction coil and creates an electromagnetic field within the coil. Your work piece is placed in that field which induces eddy currents in the workpiece. The friction from these currents generates precise, clean, non-contact heat. A water cooling system is generally required to cool the work coil and induction system. The size of the work piece and the heating application dictate the operating frequency of the induction heating equipment. Generally, the larger the work piece the lower the frequency, and the smaller the work piece the higher the frequency. The operating frequency is determined by the capacitance of the tank circuit, the inductance of the induction coil and the material properties of the work piece. If your work piece material is magnetic, such as carbon steel, it will be heated easily by induction’s two heating methods, eddy current and hysteretic heating. Hysteretic heating is very efficient up to the Curie temperature (for steel 600°C (1100°F)) when the magnetic permeability reduces to 1 and the eddy current is left to do the heating. Induced current in the work piece will flow at the surface where 80% of the heat produced in the part is generated in the outer layer (skin effect). Higher operating frequencies have a shallow skin depth, while lower operating frequencies have a thicker skin depth and greater depth of penetration. The relationship of the current flow in the work piece and the distance between the work piece and the induction coil is key; the closer the coil, the more current in the work piece. But the distance between the coil and the work piece must first be optimized for the heating required and for practical work piece handling. Many factors in the induction system can be adjusted to match to the induction coil and optimize the coupling efficiency. 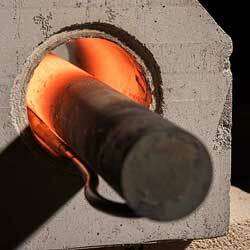 Induction heating efficiency is maximized if your work piece can be placed inside the induction coil. If your process won’t allow your work piece to be placed inside the coil, the coil can be placed inside the work piece. The size and shape of the water-cooled copper induction coil will follow the shape of your work piece and be designed to apply the heat to the correct place on the work piece. 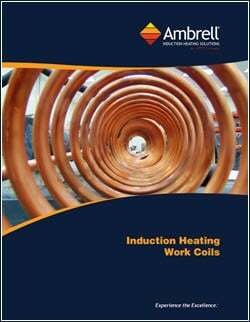 After we determine the power needed to heat your work piece we can select the correct induction heating equipment taking the induction coil coupling efficiency into consideration.